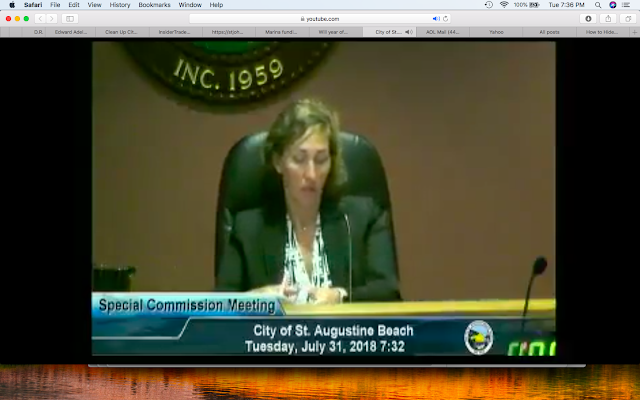 Controversial St. Augustine Beach Mayor UNDINE PAWLOWSKI GEORGE refused to allow public comment before and during the City Commission's two hour budget discussion July 31, 2018. At the beginning of the meeting, Mayor GEORGE gaveled ,and smirked and joked about denying public comment rights to her political opponent, Thomas F. Reynolds, Jr. In cutting off any and all public comment before and during the detailed budget discussion on July 31, 2018, St. Augustine Beach Mayor UNDINE GEORGE acted deranged. She attacked Mr. Reynolds for not obeying "the rules." She's walking in the foul, fetid, filthy footsteps of her tatterdemalion predecessors as St. Augustine Beach Mayor, disgraced ex-Mayors RICHARD BURTT O'BRIEN and ANDREA SAMUELS. A two hour public meeting without public comment on item after item after item, from 5:01 PM to 7:09 PM, when she belatedly invited public comment, claiming it was "welcome." She said, "this is not a time to debate." Only one citizen, Mr. Nicholas Binder, spoke. Mayor GEORGE kept citizens waiting for 128 minutes -- more than two hours -- without letting anyone speak. "At least we got one," she smirked and laughed. A violation of the First Amendment and F.S. 286. Has Mayor UNDINE GEORGE discarded any pretense of being a "reformer?" Critics say she's turned into a haughty harridan, a greedy, goofy, good-ole-gal, RICH O'BRIEN in drag. I'm now inclined to agree with them. Mayor UNDINE GEORGE, a licensed attorney who owns ANASTASIA LAW, is a registered Republican, one of five on the five-member St. Augustine Beach City Commission. Has Mayor UNDINE GEORGE proven incompetent, insouciant, insular and insolent to First Amendment rights? She lacks real world experience and looks down her distended nostrils at public comment. "Direction" from City Manager BRUCE MAX ROYLE and City Attorney JAMES PATRICK WILSON, as Mayor GEORGE put it in her July 31, 2018 8:08 PM text message on public comment, stating inter alia, ".... I got ur voice mail message as I was going in and got direction from jim and max about public comment. Undisclosed clients, past and present. Mayor UNDINE GEORGE is married to EDWARD GEORGE, former Mayor of St. Augustine Beach. Mayor UNDINE GEORGE's father, Dr. MICHEL S. PAWLOWSKI, D.Sci., is President of "TRUMP CLUB." Before he moved to Florida, Mayor GEORGE's father, Dr. MICHEL SERGE PAWLOWSKI, was charged by State's Attorney RALPH JOSEPH LARIZZA with election fraud. PAWLOWSKI voted for his daughter while he still worked for FEMA as an SES employee in Maryland; PAWLOWSKI took a plea bargain, paid a fine, got probation and took an "adjudication withheld." Concerned about the lack of public comment on the meeting agenda, I left a telephone message for Mayor UNDINE GEORGE before the budget meeting. The call was never returned. As my great- grandmother would say, "she's typical of her type." Enough PR puffery in The St. Augustine Record for exclusionary clubs to which the Establishment belongs, including Editor Craig Richardson. Can the Record report more news and less propaganda? It's our money. We pay you to be journalists, not publicists, and not apologists. The Rotary Club of St. Augustine has contributed to community and charitable projects since 1920. The organization kicked off its 99th year (2018-19) July 2 with the installation of officers and board members. From left: Grant Misterly; Jody Kotrady-Hatin, vice-president; Susan Parker; Katherine Batenhorst; Melissa Nelson; Mel Longo; Peggy Gachet, president-elect; Dan Hilbert, secretary; Bobby Crum, president; Cecile Nusbaum; Charlie Haupt and Becca Crum, treasurer. Why is all-white club considered "news?" Because Craig Richardson is amember? Leon County Circuit Judge Charles Dodson correctly interpreted the conservation land purchase fund constitutional amendment to require conservation funds be spent on land acquisition, not overhead or flubdubs. Republican House and Senate legislative leaders, Rep. RICHARD CORCORAN and Sen. JOSEPH NEGRON filed a notice of appeal. Not disclosed in First District Court of Appeals notice of appeal. C'mon, lousy, louche lackey "legislative leaders CORCORAN and NEGRON," you can tell us. Speak. You have the right to remain silent, but we wish you wouldn't. 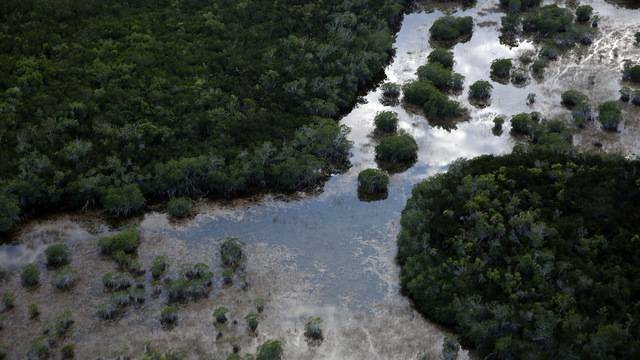 TALLAHASSEE, Fla. - Legislative leaders are appealing a Leon County circuit judge’s ruling that the state has not properly carried out a 2014 constitutional amendment that required spending on land and water conservation. 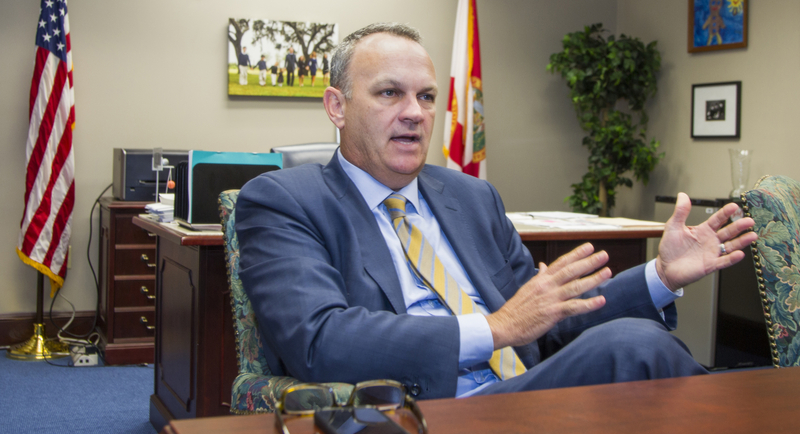 Attorneys for House Speaker Richard Corcoran, R-Land O’ Lakes, and Senate President Joe Negron, R-Stuart, filed a notice this week of taking the case to the 1st District Court of Appeal. As is common, the notice does not detail the arguments that the Legislature will make at the appeals court. Leon County Circuit Judge Charles Dodson last month ruled that lawmakers had failed to properly comply with the voter-approved constitutional amendment, which required using money from a real-estate tax to bolster land and water conservation. Environmental groups filed legal challenges against the state, contending that lawmakers had diverted portions of the money to other expenses. The notice of appeal was filed after Dodson refused to grant a rehearing in the case. Unethical, mismanaged D.R. HORTON, Inc. (NYSE:DRI) wants to turn Fish Island into a PUD gated community -- read all about it! Here are links to some nineteen (19) articles about D.R. HORTON (NYSE: DRI), which wants to destroy Fish Island and turn it into a gated community. D.R. HORTON presented false testimony about "abandoned" bald eagle nest -- that could be several state and federal crimes. Who is Ryan Carter? D.R. HORTON "expert" witness, testified Fish Island bald eagle nest was "abandoned." That's false. D.R. HORTON's Audit Committee must investigate. D.R. HORTON presented false testimony about "abandoned" bald eagle nest -- that could be several state and federal crimes. I. PurposeThe purpose of the Audit Committee (the “Committee”) of the Board of Directors (the “Board”) of D.R. and to prepare an audit committee report as required by Securities and Exchange Commission (“SEC”) rules to be included in the Company’s annual proxy statement. The Committee shall consist of at least three persons, all of whom are members of the Board. Each member of the Committee shall satisfy the independence requirements set forth in (i) Section 10A(m) of the Securities Exchange Act of 1934, as amended (the “Exchange Act”), and the rules adopted by the SEC thereunder, and (ii) the corporate governance and other listing standards of the New York Stock Exchange (the “NYSE”) as in effect from time to time (the “NYSE Standards”). Each member of the Committee shall be “financially literate” within the meaning of the NYSE Standards, as such term is interpreted by the Board in its business judgment (or shall become “financially literate” within a reasonable period of time after appointment to the Committee). In addition, at least one member of the Committee shall have “accounting or related financial management expertise” within the meaning of the NYSE Standards and the Exchange Act and the rules and regulations thereunder, as such term is interpreted by the Board in its business judgment. Furthermore, unless the Board determines that it is not necessary for an “audit committee financial expert” to serve on the Committee, at least one member of the Committee shall meet the requirements to be an “audit committee financial expert” within the meaning of Item 407(d)(5) of Regulation S-K.
No member of the Committee shall serve as a member of the audit committee of more than two public companies other than the Company. the directors who then comprise the Committee will continue to serve as members of the Committee until the Board takes action to elect new members of the Committee. The Board may remove or replace a member of the Committee at any time. The Board shall elect one member of the Committee to act as chairperson of the Committee (the “Chairperson”). Such member shall act as Chairperson until the next Annual Board Meeting unless he or she resigns, is removed or replaced or otherwise ceases to be a director or a member of the Committee prior to such date, in which event the Board shall appoint another member of the Committee to serve as Chairperson for his or her unexpired term. The Chairperson shall preside over all meetings of the Committee. In addition, the Chairperson shall periodically report the Committee’s findings and conclusions to the Board. The Board may remove or replace the Chairperson at any time. A majority of the members shall constitute a quorum, unless the Committee is comprised of an even number of members, in which case one-half of the members of the Committee shall constitute a quorum. The act of a majority of the members of the Committee in attendance at a meeting at which a quorum is present shall constitute an act of the Committee. The Committee shall meet at least four times annually, or more frequently as circumstances dictate. The Chairperson shall prepare and/or approve an agenda in advance of each meeting. The Committee may invite such persons in addition to the members of the Committee that it deems appropriate to attend all or part of any meeting. The Committee shall maintain minutes of its meetings and written records of its actions. The Committee shall be authorized to meet, as frequently as it determines is necessary or appropriate, with the Company’s director of internal audit, the Chief Financial Officer of the Company and the independent auditor of the Company in separate executive sessions to discuss any matters that the Chairperson or any other member of the Committee believes should be discussed. To the extent permitted by the NYSE Standards and applicable legal requirements, the Committee may delegate specified duties and responsibilities to a subcommittee created by a vote of a majority of the members of the Committee. Each subcommittee shall have one or more members designated by the Committee, and shall be governed by such procedures as the Committee shall determine from time to time. The Committee may establish such rules as it determines to be necessary or appropriate to conduct its business, so long as such rules do not contravene the express provisions of this Charter. General. The Committee shall provide such assistance as the Board shall request in connection with the general oversight of the Company’s financial reporting, legal and regulatory compliance, internal control and audit functions. pre-approve all audit engagement fees and terms and pre-approve all permissible non- audit services provided to the Company by its independent auditors (subject to the de minimus exceptions for certain non-audit services set forth in Section 10A(i)(1)(B) of the Exchange Act); provided that the Committee may delegate to one or more subcommittees the authority to grant approvals of audit and permitted non-audit services. C. Complaints. The Committee shall establish procedures for (i) the receipt, retention and treatment of complaints received by the Company regarding accounting, internal accounting controls or auditing matters, and (ii) the confidential, anonymous submission by employees of the Company of concerns regarding questionable accounting or auditing matters. Form 10-K for the last fiscal year for filing with the Securities and Exchange Commission. E. Certain limitations. It is the responsibility of the Company’s management to prepare consolidated financial statements that are complete and accurate and in accordance with generally accepted accounting principles. It is the responsibility of the Company’s independent auditors to audit those financial statements. The Committee’s responsibility in this regard is one of oversight and review. The Committee does not provide any expert or other special assistance as to such financial statements. Company’s management, internal auditors and independent auditors. Members of the Committee are not required to assume the functions or responsibilities of full-time employees of the Company or of experts in the fields of accounting or auditing. The Committee shall have the authority to engage independent counsel and other advisors, as it determines to be necessary to carry out its duties. The Committee shall have the authority to approve and authorize the payment by the Company of appropriate compensation (i) to any independent auditors engaged for the purpose of rendering or issuing an audit report or related work or performing other audit, review or attest services for the Company, and (ii) any counsel or other advisors employed by the Committee as provided above. The Company shall make available to the Committee appropriate funding for the payment of the Committee’s ordinary administrative expenses that are necessary or appropriate in carry out its duties. The Board shall conduct an annual performance evaluation of the Committee. This evaluation will be conducted by the Board in one or more separate sessions at which members of the Committee shall not be in attendance. After completing its annual performance evaluation of the Committee, the Board or a representative thereof shall review such evaluation or a summary thereof with the members of the Committee. recommend any changes it deems appropriate to the Board. As of March 31, 2017 , the aggregate market value of the registrant’s common stock held by non-affiliates of the registrant was approximately $11,733,685,000 based on the closing price as reported on the New York Stock Exchange. As of November 8, 2017 , there were 384,087,900 shares of the registrant’s common stock, par value $.01 per share, issued and 375,037,829 shares outstanding. Portions of the registrant’s definitive Proxy Statement for the 2018 Annual Meeting of Stockholders are incorporated herein by reference (to the extent indicated) in Part III. ITEM 1. ITEM 1A. ITEM 1B. ITEM 2. ITEM 3. ITEM 4. ITEM 6. ITEM 7. ITEM 7A. ITEM 8. ITEM 9. ITEM 9A. ITEM 9B. ITEM 10. ITEM 11. ITEM 12. D.R. Horton, Inc. is the largest homebuilding company in the United States as measured by number of homes closed and revenues. We construct and sell homes through our operating divisions in 79 markets in 26 states, under the names of D.R. Horton, America’s Builder , Emerald Homes, Express Homes, Freedom Homes and Pacific Ridge Homes. Our common stock is included in the S&P 500 Index and listed on the New York Stock Exchange under the ticker symbol “DHI.” Unless the context otherwise requires, the terms “D.R. Horton,” the “Company,” “we” and “our” used herein refer to D.R. Horton, Inc., a Delaware corporation, and its predecessors and subsidiaries. Our homebuilding business began in 1978 in Fort Worth, Texas, and our common stock has been publicly traded since 1992. We have expanded and diversified our homebuilding operations geographically over the years by investing available capital into our existing markets, start-up operations in new markets and acquisitions of other homebuilding companies. Our product offerings across our operating markets are broad and diverse. Our homes range in size from 1,000 to more than 4,000 square feet and in price from $100,000 to more than $1,000,000 . For the year ended September 30, 2017 , we closed 45,751 homes with an average closing price of $298,400 . Our business operations consist of homebuilding, financial services and other activities. Our homebuilding operations are the most substantial part of our business, comprising 98% of consolidated revenues, which totaled $14.1 billion in fiscal 2017 . Our homebuilding operations generate most of their revenues from the sale of completed homes, with a lesser amount from the sale of land and lots. Approximately 88% of our home sales revenue in fiscal 2017 was generated from the sale of single-family detached homes, with the remainder from the sale of attached homes, such as townhomes, duplexes, triplexes and condominiums. Our financial services operations provide mortgage financing and title agency services to homebuyers in many of our homebuilding markets. DHI Mortgage, our 100% owned subsidiary, provides mortgage financing services primarily to our homebuyers and generally sells the mortgages it originates and the related servicing rights to third-party purchasers. DHI Mortgage originates loans in accordance with purchaser guidelines and sells substantially all of its mortgage production shortly after origination. Our subsidiary title companies serve as title insurance agents by providing title insurance policies, examination and closing services, primarily to our homebuyers. In addition to our core homebuilding and financial services operations, we have subsidiaries that engage in other business activities. These subsidiaries conduct insurance-related operations, construct and own income-producing rental properties, own non-residential real estate including ranch land and improvements and own and operate oil and gas related assets. The operating results of these subsidiaries are immaterial for separate reporting and therefore are grouped together and presented as other. One of these subsidiaries, DHI Communities, recently began developing and constructing multi-family rental properties on land parcels we already owned and currently has four projects under active construction. Costs incurred by DHI Communities totaled $93.7 million at September 30, 2017 and are included in property and equipment in the Financial Services and Other section of our consolidated balance sheet. The combined assets of all of our subsidiaries engaged in other business activities totaled $143.3 million and $54.9 million at September 30, 2017 and 2016 , respectively, and the combined pre-tax loss of these subsidiaries was $11.7 million , $9.0 million and $0 in fiscal 2017 , 2016 and 2015 , respectively. We make available, as soon as reasonably practicable, on our website, www.drhorton.com , all of our reports required to be filed with the Securities and Exchange Commission (SEC). These reports can be found on the “Investor Relations” page of our website under “Financial Information” and include our annual and quarterly reports on Form 10-K and 10-Q (including related filings in XBRL format), current reports on Form 8-K, beneficial ownership reports on Forms 3, 4, and 5, proxy statements and amendments to such reports. Our SEC filings are also available to the public on the SEC’s website at www.sec.gov, and the public may read and copy any document we file at the SEC’s public reference room located at 100 F Street NE, Washington, D.C. 20549. Further information on the operation of the public reference room can be obtained by calling the SEC at 1-800-SEC-0330. In addition to our SEC filings, our corporate governance documents, including our Code of Ethical Conduct for the Chief Executive Officer, Chief Financial Officer and senior financial officers, are available on the “Investor Relations” page of our website under “Corporate Governance.” Our stockholders may also obtain these documents in paper format free of charge upon request made to our Investor Relations department. Our principal executive offices are located at 1341 Horton Circle, Arlington, Texas 76011 and our telephone number is (817) 390-8200. Information on or linked to our website is not incorporated by reference into this annual report on Form 10-K unless expressly noted. Following is an overview of our company’s operating structure and the significant processes that support our business controls, strategies and performance. Our homebuilding business began in the Dallas/Fort Worth area, which is still one of our largest homebuilding operations and home to our corporate headquarters. We currently operate in 26 states and 79 markets, which provides us with geographic diversification in our homebuilding inventory investments and our sources of revenues and earnings. We believe our geographic diversification lowers our operational risks by mitigating the effects of local and regional economic cycles, and it also enhances our earnings potential by providing more diverse opportunities to invest in our business. We conduct our homebuilding operations in the geographic regions, states and markets listed below, and we conduct our financial services operations in many of these markets. Our homebuilding operating divisions are aggregated into six reporting segments, also referred to as reporting regions, which comprise the markets below. Our financial statements and the notes thereto contain additional information regarding segment performance. Prevailing housing products, features, cost and pricing. Enhanced leverage of our general and administrative activities, which allows us flexibility to adjust to changes in market conditions and compete effectively in each of our markets. Ensuring the quality and timeliness of post-closing service and warranty repairs provided to customers. Review of major personnel decisions and division incentive compensation plans. Approval of major personnel decisions and management incentive compensation plans. We acquire land for use in our homebuilding operations after we have completed due diligence and generally after we have obtained the rights (known as entitlements) to begin development or construction work resulting in an acceptable number of residential lots. Before we acquire lots or tracts of land, we complete a feasibility study, which includes soil tests, independent environmental studies, other engineering work and financial analysis. We also evaluate the status of necessary zoning and other governmental entitlements required to develop and use the property for home construction. Although we purchase and develop land primarily to support our homebuilding activities, we may sell land and lots to other developers and homebuilders where we have excess land and lot positions or for other strategic reasons. We also enter into land/lot option contracts, in which we obtain the right, but generally not the obligation, to buy land or lots at predetermined prices on a defined schedule commensurate with anticipated home closings or planned development. Our option contracts generally are non-recourse, which limits our financial exposure to our earnest money deposited into escrow under the terms of the contract and any pre-acquisition due diligence costs we incur. This enables us to control land and lot positions with limited capital investment, which substantially reduces the risks associated with land ownership and development. We directly acquire almost all of our land and lot positions. We are a party to a small number of joint ventures, all of which are consolidated in our financial statements. Monitoring and managing the number of speculative homes (homes under construction without an executed sales contract) built in each subdivision. Substantially all of our land development and home construction work is performed by subcontractors. Subcontractors typically are selected after a competitive bidding process and are retained for a specific subdivision or series of house plans pursuant to a contract that obligates the subcontractor to complete the scope of work at an agreed-upon price. We employ land development managers and construction superintendents to monitor land development and home construction activities, participate in major design and building decisions, coordinate the activities of subcontractors and suppliers, review the work of subcontractors for quality and cost controls and monitor compliance with zoning and building codes. In addition, our construction superintendents interact with our homebuyers during the construction process and instruct buyers on post-closing home maintenance. Our home designs are selected or prepared in each of our markets to appeal to the preferences of local homebuyers in each community. Our local management teams regularly adjust our product offerings to address our customers’ expectations for affordability, home size and features. In many communities, we offer optional interior and exterior features to homebuyers for an additional charge. Construction time for our homes depends on the availability of labor, materials and supplies, the weather, the size of the home and other factors. We complete the construction of most homes within two to six months . We typically do not maintain significant inventories of land development or construction materials, except for work in progress materials for active development projects and homes under construction. Generally, the construction materials used in our operations are readily available from numerous sources. We have contracts exceeding one year with certain suppliers of building materials that are cancelable at our option. We are subject to governmental regulations that affect our land development and construction operations. At times, we have experienced delays in receiving the proper approvals from municipalities or other government agencies that have delayed our anticipated development and construction activities in certain communities. We control construction costs by designing our homes efficiently and by obtaining competitive bids for construction materials and labor. We also competitively bid and negotiate pricing from our subcontractors and suppliers based on the volume of services and products we purchase on a local, regional and national basis. We monitor our land development expenditures and construction costs versus budgets for each house and community, and we review our inventory levels, margins, expenses, profitability and returns for each operating market compared to both its business plan and our performance expectations. We control overhead costs by centralizing certain accounting and administrative functions and by monitoring staffing and compensation levels. We review other general and administrative costs to identify efficiencies and savings opportunities in our operating divisions and our regional and corporate offices. We also direct many of our promotional activities toward local real estate brokers and digital marketing initiatives, which we believe are efficient uses of our marketing expenditures. We also use the Pacific Ridge Homes brand in our Seattle market following our acquisition of their homebuilding operations in fiscal 2015, and their product offerings are similar to, and included with, our D.R. Horton branded communities shown above. We market and sell our homes primarily through commissioned employees, and the majority of our home closings also involve an independent real estate broker. We typically conduct home sales from sales offices located in furnished model homes in each subdivision, and we generally do not offer our model homes for sale until the completion of a subdivision. Our sales personnel assist prospective homebuyers by providing floor plans and price information, demonstrating the features and layouts of our homes and assisting with the selection of options, when available. We train and inform our sales personnel as to the availability of financing, construction schedules and marketing and advertising plans. As market conditions warrant, we may provide potential homebuyers with incentives, such as discounts or free upgrades, to be competitive in a particular market or to attain our targeted sales pace. We market our homes and communities to prospective homebuyers and real estate brokers digitally, through email, search engine marketing, social media and our company website and other real estate websites, in addition to print media and advertisement. We also use billboards, radio, television, magazine and newspaper advertising locally as necessary. We attempt to position our subdivisions in locations that are desirable to potential homebuyers and convenient to or visible from local traffic patterns, which helps to reduce advertising costs. Model homes play an important role in our marketing efforts, and we expend significant effort and resources to create an attractive atmosphere in our model homes. We also build speculative homes in most of our communities, which allow us to compete effectively with existing homes available in the market and improve our profits and returns. These homes enhance our marketing and sales efforts to prospective homebuyers who are renters or who are relocating to these markets and require a home within a short time frame, as well as to independent brokers who represent these homebuyers. We determine our speculative homes strategy in each market based on local market factors, such as new job growth, the number of job relocations, housing demand and supply, seasonality, current sales contract cancellation trends and our past experience in the market. We maintain a level of speculative home inventory in each community based on our current and planned sales pace, and we monitor and adjust speculative home inventory on an ongoing basis as conditions warrant. Our sales contracts require an earnest money deposit which varies in amount across our markets and communities. Additionally, customers are generally required to pay additional deposits when they select options or upgrade features for their homes. Our sales contracts include a financing contingency which permits customers to cancel and receive a refund of their deposit if they cannot obtain mortgage financing at prevailing or specified interest rates within a specified period. Our contracts may include other contingencies, such as the sale of an existing home. We either retain or refund customer deposits on cancelled sales contracts, depending upon the applicable provisions of the contract or other circumstances. Sales order backlog represents homes under contract but not yet closed at the end of the period. At September 30, 2017 , the value of our backlog of sales orders was $3.7 billion ( 12,329 homes), an increase of 8% from $3.4 billion ( 11,475 homes) at September 30, 2016 . The average sales price of homes in backlog was $302,200 at September 30, 2017 , up 1% from the $299,600 average at September 30, 2016 . Many of the contracts in our sales order backlog are subject to contingencies, such as those described above, which can result in cancellations. A portion of the contracts in backlog will not result in closings due to cancellations. As a percentage of gross sales orders, cancellations of sales contracts were 22% and 23% in fiscal 2017 and 2016 , respectively. The length of time between the signing of a sales contract for a home and delivery of the home to the buyer (closing) is generally from two to six months ; therefore, substantially all of the homes in our sales backlog at September 30, 2017 are scheduled to close in fiscal year 2018 . Our operating divisions are responsible for pre-closing quality control inspections and responding to customers’ post-closing needs. We believe that a prompt and courteous response to homebuyers’ needs during and after construction reduces post-closing repair costs, enhances our reputation for quality and service and ultimately leads to repeat and referral business from the real estate community and homebuyers. We typically provide our homebuyers with a ten-year limited warranty for major defects in structural elements such as framing components and foundation systems, a two-year limited warranty on major mechanical systems, and a one-year limited warranty on other construction components. The subcontractors who perform the actual construction also provide us with warranties on workmanship and are generally prepared to respond to us and the homeowner promptly upon request. In addition, some of our suppliers provide manufacturer’s warranties on specified products installed in the home. We provide mortgage financing services principally to purchasers of our homes in the majority of our homebuilding markets through DHI Mortgage, our 100% owned subsidiary. DHI Mortgage assists in the sales transaction by coordinating the mortgage application, mortgage commitment and home closing processes to facilitate a timely and efficient home buying experience for our buyers. During the year ended September 30, 2017 , DHI Mortgage provided mortgage financing services for approximately 56% of our total homes closed, and approximately 95% of DHI Mortgage’s loan volume related to homes closed by our homebuilding operations. Most of our homebuilding divisions also work with a number of additional mortgage lenders that offer a range of mortgage financing programs to our homebuyers. To limit the risks associated with our mortgage operations, DHI Mortgage originates loan products that we believe can be sold to third-party purchasers of mortgage loans, the majority of which are eligible for sale to the Federal National Mortgage Association (Fannie Mae), the Federal Home Loan Mortgage Corporation (Freddie Mac) or the Government National Mortgage Association (Ginnie Mae). DHI Mortgage sells substantially all of the loans and their servicing rights to third-party purchasers shortly after origination with limited recourse provisions. DHI Mortgage centralizes most of its control and oversight functions, including those related to loan underwriting, quality control, regulatory compliance, secondary marketing of loans, hedging activities, accounting and financial reporting. Through our subsidiary title companies, we serve as a title insurance agent in selected markets by providing title insurance policies, examination and closing services primarily to our homebuilding customers. We currently assume little or no underwriting risk associated with these title policies. At September 30, 2017 , we employed 7,735 persons, of whom 1,673 were sales and marketing personnel, 2,157 were involved in construction, 2,107 were office personnel and 1,798 worked in mortgage and title operations. We focus significant attention toward attracting and retaining talented and experienced individuals to manage and support our operations, and we believe that we have good relations with our employees. We routinely evaluate opportunities to profitably expand our operations, including potential acquisitions of other homebuilding or related businesses. Acquisitions of homebuilding businesses usually provide us with immediate land and home inventories and control of additional land and lot positions through option contracts. Also, employees of acquired businesses generally have specialized knowledge of local market conditions, including existing relationships with municipalities, land owners, developers, subcontractors and suppliers. These inventory positions and local market knowledge and relationships could take us several years to develop through our own efforts. We seek to limit the risks associated with acquiring other companies by conducting extensive operational, financial and legal due diligence on each acquisition and by performing financial analysis to determine that each acquisition will have a positive impact on our earnings within an acceptable period of time. In September 2016 , we acquired the homebuilding operations of Wilson Parker Homes, which operated in Atlanta and Augusta, Georgia; Raleigh, North Carolina; Columbia, South Carolina and Phoenix, Arizona. Subsequent to September 30, 2017, we acquired 75% of the outstanding shares of Forestar Group Inc. (Forestar) for $558.3 million in cash, pursuant to the terms of the June 2017 merger agreement. Forestar is and will continue to be a publicly-traded residential and real estate development company with operations currently in 14 markets and 10 states, where it owns, directly or through joint ventures, interests in 44 residential and mixed-use projects. Our alignment with Forestar advances our strategy of increasing our access to high-quality optioned land and lot positions to enhance operational efficiency and returns. Both companies are identifying land development opportunities to expand Forestar’s platform, and we plan to acquire a large portion of Forestar’s finished lots in accordance with the master supply agreement between the two companies. The homebuilding industry is highly competitive. We compete with numerous other national, regional and local homebuilders for homebuyers, desirable land, raw materials, skilled labor, employees, management talent and financing. We also compete with resales of existing and foreclosed homes and with the rental housing market. Our homes compete on the basis of quality, price, location, design and mortgage financing terms. The competitors to our financial services businesses include other mortgage lenders and title companies, including national, regional and local mortgage bankers and other financial institutions. Some of these competitors are subject to fewer governmental regulations and may have greater access to capital, and some of them may operate with different lending criteria and may offer a broader array of financing and other products and services to consumers than we do. However, we work diligently to provide flexible, fairly priced financing alternatives subject to applicable regulation. The homebuilding industry is subject to extensive and complex regulations. We and the subcontractors we use must comply with many federal, state and local laws and regulations. These include zoning, density and development requirements and building, environmental, advertising, labor and real estate sales rules and regulations. These regulations and requirements affect substantially all aspects of our land development and home design, construction and sales processes in varying degrees across our markets. Our homes are inspected by local authorities where required, and homes eligible for insurance or guarantees provided by the Federal Housing Administration (FHA) and the Department of Veteran Affairs (VA) are subject to inspection by them. These regulations often provide broad discretion to the administering governmental authorities. In addition, our new housing developments may be subject to various assessments for schools, parks, streets, utilities and other public improvements. Our homebuilding operations are also subject to an extensive array of local, state and federal statutes, ordinances, rules and regulations concerning protection of health, safety and the environment. The particular environmental laws for each site vary greatly according to location, environmental condition and the present and former uses of the site and adjoining properties. Our mortgage company must comply with extensive state and federal laws and regulations, which are administered by numerous agencies, including but not limited to the Consumer Financial Protection Bureau (CFPB), Federal Housing Finance Agency, U.S. Department of Housing and Urban Development, FHA, VA, United States Department of Agriculture (USDA), Fannie Mae, Freddie Mac and Ginnie Mae. These laws and regulations include many compliance requirements, including but not limited to licensing, consumer disclosures, fair lending and real estate settlement procedures. As a result, our operations are subject to regular, extensive examinations by the applicable agencies. Although significant changes in market conditions have impacted our seasonal patterns in the past and could do so again in the future, we generally close more homes and generate greater revenues and operating income in the third and fourth quarters of our fiscal year. The seasonal nature of our business can also cause significant variations in our working capital requirements in both our homebuilding and financial services operations. As a result of seasonal activity, our quarterly results of operations and financial position at the end of a particular fiscal quarter are not necessarily representative of the balance of our fiscal year. Discussion of our business and operations included in this annual report on Form 10-K should be read together with the risk factors set forth below. They describe various risks and uncertainties we are or may become subject to, many of which are difficult to predict or beyond our control. These risks and uncertainties, together with other factors described elsewhere in this report, have the potential to affect our business, financial condition, results of operations, cash flows, strategies or prospects in a material and adverse manner. The homebuilding industry is cyclical and affected by changes in economic, real estate or other conditions that could adversely affect our business or financial results. Adverse changes in these general and local economic conditions or deterioration in the broader economy would cause a negative impact on our business and financial results and increase the risk for asset impairments and writeoffs. Changes in these economic conditions may affect some of our regions or markets more than others. If adverse conditions affect our larger markets, they could have a proportionately greater impact on us than on some other homebuilding companies. In the past, concerns regarding the federal government’s fiscal policies and economic stimulus actions have created uncertainty in the financial markets and caused volatility in interest rates, which has impacted business and consumer confidence. Federal government actions and new legislation related to economic stimulus, taxation, spending levels and borrowing limits, along with the related political debates, conflicts and compromises associated with such actions, may negatively impact the financial markets and consumer confidence. Such events could hurt the U.S. economy and the housing market and in turn, could adversely affect the operating results of our homebuilding, financial services and other businesses. Weather conditions and natural disasters, such as hurricanes, tornadoes, earthquakes, volcanic activity, droughts and floods, heavy or prolonged precipitation or wildfires, can harm our homebuilding business. These can delay our development work, home construction and home closings, adversely affect the cost or availability of materials or labor or damage homes under construction. The climates and geology of many of the states in which we operate, including California, Florida, Texas and other coastal areas, where we have some of our larger operations and which have experienced recent natural disasters, present increased risks of adverse weather or natural disasters. Deployments of U.S. military personnel to foreign regions, terrorist attacks, other acts of violence or threats to national security and any corresponding response by the United States or others, related domestic or international instability or civil unrest may cause an economic slowdown in the markets where we operate, which could adversely affect our homebuilding business. Public health issues such as a major epidemic or pandemic could adversely affect our business. The U.S. and other countries have experienced, and may experience in the future, outbreaks of contagious diseases that affect public perception of health risk. In the event of a widespread, prolonged, actual or perceived outbreak of a contagious disease, our operations could be negatively impacted by a reduction in customer traffic or other factors which could reduce demand for new homes. If we experience any of the foregoing, potential customers may be less willing or able to buy our homes. In the future, our pricing and product strategies may also be limited by market conditions. We may be unable to change the mix of our home offerings, reduce the costs of the homes we build, offer more affordable homes or satisfactorily address changing market conditions in other ways without adversely affecting our profit margins. In addition, cancellations of home sales contracts in backlog may increase if homebuyers do not honor their contracts due to any of the factors discussed above. Our financial services business is closely related to our homebuilding business, as it originates mortgage loans principally to purchasers of the homes we build. A decrease in the demand for our homes because of the foregoing matters will also adversely affect the financial results of this segment of our business. An increase in the default rate on the mortgages we originate may adversely affect our ability to sell the mortgages or the pricing we receive upon the sale of mortgages or may increase our recourse obligations for previous originations. We may be responsible for losses associated with mortgage loans originated and sold to third-party purchasers in the event of errors or omissions relating to certain representations and warranties that the loans sold meet certain requirements, including representations as to underwriting standards, the type of collateral, the existence of primary mortgage insurance, and the validity of certain borrower representations in the connection with the loan. We establish reserves related to mortgages we have sold; however, actual future obligations related to these mortgages could differ significantly from our current estimated amounts. Constriction of the credit markets could limit our ability to access capital and increase our costs of capital. During past economic and housing downturns, the credit markets constricted and reduced some sources of liquidity that were previously available to us. Consequently, we relied principally on our cash on hand to meet our working capital needs and repay outstanding indebtedness during those times. There likely will be periods in the future when financial market upheaval will increase our cost of capital or limit our ability to access the public debt markets or obtain bank financing. We have a $1.275 billion senior unsecured revolving credit facility with an uncommitted accordion feature that could increase the size of the facility to $1.9 billion , subject to certain conditions and availability of additional bank commitments. The facility also provides for the issuance of letters of credit with a sublimit equal to approximately 50% of the revolving credit commitment. The maturity date of the commitments under the facility is September 25, 2022 . Also, our mortgage subsidiary utilizes a $600 million mortgage repurchase facility to finance the majority of the loans it originates. The capacity of the facility increases, without requiring additional commitments, to $725 million for approximately 30 days at each quarter end and to $800 million for approximately 45 days at fiscal year end. The capacity can also be increased to $1.0 billion subject to the availability of additional commitments. The mortgage repurchase facility must be renewed annually and currently expires on February 23, 2018 . We expect to renew and extend the term of the mortgage repurchase facility with similar terms prior to its maturity. Adverse changes in market conditions could make the renewal of these facilities more difficult or could result in an increase in the cost of these facilities or a decrease in the committed amounts. Such changes affecting our mortgage repurchase facility may also make it more difficult or costly to sell the mortgages that we originate. We regularly assess our projected capital requirements to fund growth in our business, repay debt obligations, and support other general corporate and operational needs, and we regularly evaluate our opportunities to raise additional capital. We have an automatically effective universal shelf registration statement filed with the SEC in August 2015, registering debt and equity securities that we may issue from time to time in amounts to be determined. As market conditions permit, we may issue new debt or equity securities through the public capital markets or obtain additional bank financing to fund our projected capital requirements or provide additional liquidity. In October 2017 , we used cash on hand to purchase 75% of the outstanding shares of Forestar Group Inc. (Forestar) for $558.3 million . We believe that our existing cash resources, our revolving credit facility, our mortgage repurchase facility and our ability to access the capital markets will provide sufficient liquidity to fund our working capital needs and debt obligations, including the maturity of $400 million principal amount of senior notes in fiscal 2018 . Adverse changes in economic, homebuilding or capital market conditions could negatively affect our business, liquidity and financial results, restrict our ability to obtain additional capital or increase our costs of capital. Reductions in the availability of mortgage financing provided by government agencies, changes in government financing programs, a decrease in our ability to sell mortgage loans on attractive terms or an increase in mortgage interest rates could decrease our buyers’ ability to obtain financing and adversely affect our business or financial results. The mortgage loans originated by our financial services operations are primarily eligible for sale to Fannie Mae, Freddie Mac and Ginnie Mae and are sold to third-party purchasers. The secondary market for mortgage loans continues to primarily desire securities backed by Fannie Mae, Freddie Mac or Ginnie Mae, and we believe the liquidity these agencies provide to the mortgage industry is important to the housing market. There have been ongoing discussions within the government regarding the long-term structure and viability of Fannie Mae and Freddie Mac, which could result in adjustments to the size of their loan portfolios and to guidelines for their loan products. Any reduction in the availability of financing provided by these institutions could adversely affect interest rates, mortgage availability and sales of new homes and mortgage loans. During fiscal 2017 , approximately 84% of our mortgage loans were sold to three major financial entities, one of which purchased 45% of the total loans sold. On an ongoing basis, we seek to establish loan purchase arrangements with additional financial entities. If we are unable to sell mortgage loans to purchasers on attractive terms, our ability to originate and sell mortgage loans at competitive prices could be limited, which would negatively affect our profitability. The FHA insures mortgage loans that generally have lower credit requirements and is an important source for financing the sale of our homes. Changes, restrictions or significant premium increases in FHA programs in the future may negatively affect the availability or affordability of FHA financing, which could adversely affect our ability to sell homes. Some of our customers may qualify for 100% financing through programs offered by the VA, USDA and certain other housing finance agencies. These programs are subject to changes in regulations, lending standards and government funding levels. There can be no assurances that these programs or other programs will continue to be available in our homebuilding markets or that they will be as attractive to our customers as the programs currently offered, which could negatively affect our sales. Mortgage rates are currently low as compared to most historical periods; however, they are expected to increase as the Federal Reserve Board has raised its benchmark rate several times over the past year and has indicated further interest rate increases are likely. When interest rates increase, the cost of owning a home will increase, which will likely reduce the number of potential homebuyers who can obtain mortgage financing, and could result in a decline in the demand for our homes. The risks associated with our land and lot inventory could adversely affect our business or financial results. Inventory risks are substantial for our homebuilding business. There are risks inherent in controlling, owning and developing land. If housing demand declines, we may not be able to build and sell homes profitably in some of our communities, and we may not be able to fully recover the costs of some of the land and lots we own. Also, the values of our owned undeveloped land, lots and housing inventories may fluctuate significantly due to changes in market conditions. As a result, our deposits for lots controlled under option or similar contracts may be put at risk, we may have to sell homes or land for a lower profit margin or record inventory impairment charges on our land and lots. A significant deterioration in economic or homebuilding industry conditions may result in substantial inventory impairment charges. We cannot make any assurances that our growth strategies, acquisitions or investments will be successful or will not expose us to additional risks or other negative consequences. In recent years, we have primarily grown our business by increasing our investments in land, lot and home inventories in our existing homebuilding markets. We have also expanded through investments in new product offerings and in new geographic markets. Investments in land, lots and home inventories can expose us to risks of economic loss and inventory impairments if housing conditions weaken or if we are unsuccessful in implementing our growth strategies. Subsequent to September 30, 2017, we made an investment of $558.3 million in cash to acquire 75% of the outstanding shares of Forestar, pursuant to the terms of the June 2017 merger agreement. Forestar is and will continue to be a publicly-traded residential and real estate development company with operations currently in 14 markets and 10 states, where it owns, directly or through joint ventures, interests in 44 residential and mixed-use projects. Our alignment with Forestar advances our strategy of increasing our access to high-quality optioned land and lot positions to enhance operational efficiency and returns. Both companies are identifying land development opportunities to expand Forestar’s platform, and we plan to acquire a large portion of Forestar’s finished lots in accordance with the master supply agreement between the two companies. In addition to the investment and merger with Forestar, we have acquired the homebuilding operations of several companies since fiscal 2012, and we may make strategic acquisitions of or investments in other companies, operations or assets in the future. Such acquisitions and investments may have risks similar to those related to land, lots and home inventories, but they may also expose us to additional risks or other negative consequences. These transactions may not advance our business strategy, provide a satisfactory return on our investment or provide other benefits we anticipate. Also, the integration of these transactions may not be successful and may require significant time and resources, which may divert management’s attention from other operations. Acquisitions and investments could also expose us to material liabilities not discovered in the due diligence process and may lead to litigation. If these transactions under-perform our expectations or are unsuccessful, we may incur significant expenses or write-offs of inventory, other assets or intangible assets such as goodwill. Acquisitions and investments can result in dilution to existing stockholders if we issue our common stock as consideration, and can increase our debt levels or reduce our liquidity if we purchase them with cash. The magnitude, timing and nature of any future acquisitions or investments will depend on a number of factors, including our ability to identify suitable additional markets or acquisition candidates, the negotiation of acceptable terms, our financial capabilities and general economic and business conditions. We also may seek to divest an investment or a business and may have difficulty selling such investment or business on acceptable terms in a timely manner. Homebuilding is subject to home warranty and construction defect claims in the ordinary course of business that can be significant. We are subject to home warranty and construction defect claims arising in the ordinary course of our homebuilding business. We rely on subcontractors to perform the actual construction of our homes, and in many cases, to select and obtain construction materials. Despite our detailed specifications and monitoring of the construction process, our subcontractors occasionally do not meet adequate quality standards in the construction of our homes. When we find these issues, we repair them in accordance with our warranty obligations. We spend significant resources to repair items in homes we have sold to fulfill the warranties we issued to our homebuyers. Additionally, we are subject to construction defect claims which can be costly to defend and resolve in the legal system. Warranty and construction defect matters can also result in negative publicity in the media and on the internet, which can damage our reputation and adversely affect our ability to sell homes. Based on the large number of homes we have sold over the years, our potential liabilities related to warranty and construction defect claims are significant. As a consequence, we maintain product liability insurance, and we seek to obtain indemnities and certificates of insurance from subcontractors covering claims related to their workmanship and materials. We establish warranty and other reserves for the homes we sell based on historical experience in our markets and our judgment of the qualitative risks associated with the types of homes built. Because of the uncertainties inherent to these matters, we cannot provide assurance that our insurance coverage, our subcontractor arrangements and our reserves will be adequate to address all of our future warranty and construction defect claims. Contractual indemnities can be difficult to enforce, we may be responsible for applicable self-insured retentions and some types of claims may not be covered by insurance or may exceed applicable coverage limits. Additionally, the coverage offered by and the availability of product liability insurance for construction defects is limited and costly. We have responded to increases in insurance costs and coverage limitations by increasing our self-insured retentions and claim reserves. There can be no assurance that coverage will not be further restricted or become more costly. If costs to resolve our future warranty and construction defect claims exceed our estimates, our financial results and liquidity could be adversely affected. A health and safety incident relating to our operations could be costly in terms of potential liability and reputational damage. Building sites are inherently dangerous, and operating in the homebuilding industry poses certain inherent health and safety risks. Due to health and safety regulatory requirements and the number of homes we construct, health and safety performance is critical to the success of our business. Any failure in health and safety performance may result in penalties for non-compliance with relevant regulatory requirements, and a failure that results in a major or significant health and safety incident is likely to be costly and could expose us to liability that could be costly. Such an incident could generate significant negative publicity and have a corresponding impact on our reputation, our relationships with relevant regulatory agencies or governmental authorities, and our ability to attract customers and employees, which in turn could have a material adverse effect on our financial results and liquidity. Damage to our corporate reputation or brands from negative publicity could adversely affect our business, financial results and/or stock price. Adverse publicity related to our company, industry, personnel, operations or business performance may cause damage to our corporate reputation or brands and may generate negative sentiment, potentially affecting the performance of our business or our stock price, regardless of its accuracy or inaccuracy. Negative publicity can be disseminated rapidly through digital platforms, including social media, websites, blogs and newsletters. Customers and other interested parties value readily available information and often act on such information without further investigation and without regard to its accuracy. The harm may be immediate without affording us an opportunity for redress or correction, and our success in preserving our brand image depends on our ability to recognize, respond to and effectively manage negative publicity in a rapidly changing environment. Adverse publicity or unfavorable commentary from any source could damage our reputation, reduce the demand for our homes or negatively impact the morale and performance of our employees, which could adversely affect our business. Supply shortages and other risks related to acquiring land, building materials and skilled labor could increase our costs and delay deliveries. volatile increases in the cost of materials, particularly increases in the price of lumber, drywall and cement, which are significant components of home construction costs. These factors may increase our build times or cause us to incur more costs building our homes. If the level of new home demand increases significantly in future periods, the risk of shortages in residential lots, labor and materials available to the homebuilding industry will likely increase. Our business and financial results could be adversely affected by significant inflation, higher interest rates or deflation. Inflation can adversely affect us by increasing costs of land, materials and labor. In addition, significant inflation is often accompanied by higher interest rates, which have a negative impact on housing affordability. In a highly inflationary environment, depending on industry and other economic conditions, we may be precluded from raising home prices enough to keep up with the rate of inflation, which could reduce our profit margins. Moreover, with inflation, the costs of capital, labor and materials can increase and the purchasing power of our cash resources can decline. Current or future efforts by the government to stimulate the economy may increase the risk of significant inflation and its adverse impact on our business or financial results. Alternatively, a significant period of deflation could cause a decrease in overall spending and borrowing levels. This could lead to deterioration in economic conditions, including an increase in the rate of unemployment. Deflation could also cause the value of our inventories to decline or reduce the value of existing homes below the related mortgage loan balance, which could potentially increase the supply of existing homes. If oil prices decline significantly, economic conditions in markets that have significant exposure to the energy sector may weaken. These, or other factors that increase the risk of significant deflation, could have a negative impact on our business or financial results. We often are required to provide surety bonds to secure our performance or obligations under construction contracts, development agreements and other arrangements. At September 30, 2017 , we had $1.2 billion of outstanding surety bonds. Our ability to obtain surety bonds primarily depends upon our credit rating, financial condition, past performance and other factors, including the capacity of the surety market and the underwriting practices of surety bond issuers. The ability to obtain surety bonds also can be impacted by the willingness of insurance companies to issue performance bonds for construction and development activities. If we are unable to obtain surety bonds when required, our results of operations and cash flows could be adversely affected. Increases in the costs of owning a home could prevent potential customers from buying our homes and adversely affect our business or financial results. Significant expenses of owning a home, including mortgage interest and real estate taxes, generally are deductible expenses for an individual’s federal, and in some cases state, income taxes, subject to various limitations under current tax law and policy. If the federal government or a state government changes its income tax laws, as has been discussed from time to time, to eliminate or substantially modify these income tax deductions, the after-tax cost of owning a new home would increase for many of our potential customers. The loss or reduction of homeowner tax deductions, if such tax law changes were enacted without offsetting provisions, could adversely affect demand for and sales prices of new homes. In addition, increases in property tax rates by local governmental authorities, as experienced in some areas in response to reduced federal and state funding, could adversely affect the amount of financing our potential customers could obtain or their desire to purchase new homes. Governmental regulations and environmental matters could increase the cost and limit the availability of our development and homebuilding projects and adversely affect our business or financial results. We are subject to extensive and complex regulations that affect land development and home construction, including zoning, density restrictions, building design and building standards. These regulations often provide broad discretion to the administering governmental authorities as to the conditions we must meet prior to development or construction being approved, if approved at all. We are subject to determinations by these authorities as to the adequacy of water or sewage facilities, roads or other local services. New housing developments may also be subject to various assessments for schools, parks, streets and other public improvements. In addition, in many markets government authorities have implemented no growth or growth control initiatives. Any of these may limit, delay or increase the costs of development or home construction. We are also subject to a significant number and variety of local, state and federal laws and regulations concerning protection of health, safety, labor standards and the environment. The impact of environmental laws varies depending upon the prior uses of the building site or adjoining properties and may be greater in areas with less supply where undeveloped land or desirable alternatives are less available. These matters may result in delays, may cause us to incur substantial compliance, remediation, mitigation and other costs, and can prohibit or severely restrict development and homebuilding activity in environmentally sensitive regions or areas. Government agencies also routinely initiate audits, reviews or investigations of our business practices to ensure compliance with these laws and regulations, which can cause us to incur costs or create other disruptions in our business that can be significant. For example, we have received Notices of Violation from the United States Environmental Protection Agency related to stormwater compliance at certain of our sites in the Southeast. This matter could potentially result in requirements for us to perform additional compliance procedures and to pay monetary sanctions. The subcontractors we rely on to perform the actual construction of our homes are also subject to a significant number of local, state and federal laws and regulations, including laws involving matters that are not within our control. If the subcontractors who construct our homes fail to comply with all applicable laws, we can suffer reputational damage, and may be exposed to possible liability. We are also subject to an extensive number of laws and regulations because our common stock and debt securities are publicly traded in the capital markets. These regulations govern our communications with our shareholders and the capital markets, our financial statement disclosures and our legal processes, and they also impact the work required to be performed by our independent registered public accounting firm and our legal counsel. Changes in these laws and regulations, including the subsequent implementation of rules by the administering government authorities, may require us to incur additional compliance costs, and such costs may be significant. Governmental regulation of our financial services operations could adversely affect our business or financial results. Our financial services operations are subject to extensive state and federal laws and regulations, which are administered by numerous agencies, including but not limited to the CFPB, Federal Housing Finance Agency, U.S. Department of Housing and Urban Development, FHA, VA, USDA, Fannie Mae, Freddie Mac and Ginnie Mae. These laws and regulations include many compliance requirements, including but not limited to licensing, consumer disclosures, fair lending and real estate settlement procedures. As a result, our operations are subject to regular, extensive examinations by the applicable agencies. In fiscal 2013, our mortgage subsidiary was subpoenaed by the United States Department of Justice (DOJ) regarding the adequacy of certain underwriting and quality control processes related to FHA loans originated and sold in prior years. We have provided information related to these loans and our processes to the DOJ, and communications are ongoing. The DOJ has to date not asserted any formal claim amount, penalty or fine. Due to the significant increases in regulations, operating costs have increased for our mortgage operations. The possibility of additional future regulations, changing rule interpretations and examinations by regulatory agencies may result in more stringent compliance standards and could adversely affect the results of our operations. We have significant amounts of consolidated debt and may incur additional debt; our debt obligations and our ability to comply with related covenants, restrictions or limitations could adversely affect our financial condition. As of September 30, 2017 , our consolidated debt was $2.9 billion , and we had $829.6 million principal amount of our debt maturing before the end of fiscal 2018 , including $400 million principal amount of senior notes and $420 million outstanding under the mortgage repurchase facility. The indenture governing our senior notes does not restrict the incurrence of future unsecured debt by us or our homebuilding subsidiaries or the incurrence of secured or unsecured debt by our financial services subsidiaries, and the agreement governing our revolving credit facility allows us to incur a substantial amount of future unsecured debt. Also, the indenture governing our senior notes and the agreement governing our revolving credit facility impose restrictions on our ability and on that of the guarantors to incur debt secured by certain assets, but still permit us and our homebuilding subsidiaries to incur significant amounts of additional secured debt. limit our ability to obtain future financing for working capital, capital expenditures, acquisitions, debt service requirements or other requirements. Dependence on future performance. Our ability to meet our debt service and other obligations and the financial covenants under our revolving credit and mortgage repurchase facilities will depend, in part, upon our future financial performance. Our future results are subject to the risks and uncertainties described in this report. Our revenues and earnings vary with the level of general economic activity in the markets we serve. Our businesses are also affected by financial, political, business and other factors, many of which are beyond our control. The factors that affect our ability to generate cash can also affect our ability to raise additional funds for these purposes through the sale of debt or equity, the refinancing of debt or the sale of assets. Changes in prevailing interest rates may affect the cost of our debt service obligations, because borrowings under our revolving credit facility and mortgage repurchase facility bear interest at floating rates. Revolving credit facility. Our revolving credit facility contains financial covenants requiring the maintenance of a maximum allowable ratio of debt to tangible net worth and a borrowing base restriction if our ratio of debt to tangible net worth exceeds a certain level. A failure to comply with these requirements could allow the lending banks to terminate the availability of funds under our revolving credit facility or cause any outstanding borrowings to become due and payable prior to maturity. Mortgage repurchase facility and other restrictions. The mortgage repurchase facility for our mortgage subsidiary requires the maintenance of a minimum level of tangible net worth, a maximum allowable ratio of debt to tangible net worth and a minimum level of liquidity by our mortgage subsidiary. A failure to comply with these requirements could allow the lending banks to terminate the availability of funds to our mortgage subsidiary or cause any outstanding borrowings to become due and payable prior to maturity. Any difficulty experienced in complying with these covenants could make the renewal of the facility more difficult or costly. In addition, although our financial services business is conducted through subsidiaries that are not restricted by the indenture governing our senior notes or the agreement governing our revolving credit facility, the ability of our financial services subsidiaries to distribute funds to our homebuilding operations would be restricted in the event such distribution would cause an event of default under the mortgage repurchase facility or if an event of default had occurred under this facility. Moreover, our right to receive assets from these subsidiaries upon their liquidation or recapitalization is subject to the prior claims of the creditors of these subsidiaries. Any claims we may have to funds from our financial services subsidiaries would be subordinate to subsidiary indebtedness to the extent of any security for such indebtedness and to any indebtedness otherwise recognized as senior to our claims. Changes in debt ratings. Our senior unsecured debt is currently rated investment grade by all three major rating agencies; however, there can be no assurance that we will be able to maintain this rating. Any lowering of our debt ratings could make accessing the public capital markets or obtaining additional credit from banks more difficult and/or more expensive. Change of control purchase options and change of control default. Upon the occurrence of both a change of control and a ratings downgrade event, each as defined in the indenture governing our senior notes, we will be required to offer to repurchase such notes at 101% of their principal amount, together with all accrued and unpaid interest, if any. Moreover, a change of control (as defined in our revolving credit facility) would constitute an event of default under our revolving credit facility, which could result in the acceleration of the repayment of any borrowings outstanding under our revolving credit facility, a requirement to cash collateralize all letters of credit outstanding thereunder and the termination of the commitments thereunder. If repayment of more than $50 million outstanding under our revolving credit facility were accelerated and such acceleration were not rescinded or such indebtedness were not satisfied, in either case within 30 days, an event of default would result under the indenture governing our senior notes, entitling the trustee for the notes or holders of at least 25 percent in principal amount of the relevant series of notes then outstanding to declare all such notes to be due and payable immediately. If purchase offers were required under the indenture for our notes, repayment of the borrowings under our revolving credit facility were required, or if our senior notes were accelerated, we can give no assurance that we would have sufficient funds to pay the required amounts. Homebuilding and financial services are very competitive industries, and competitive conditions could adversely affect our business or financial results. The homebuilding industry is highly competitive. Homebuilders compete not only for homebuyers, but also for desirable properties, financing, raw materials and skilled labor. We compete with local, regional and national homebuilders, and also with existing home sales, foreclosures and rental properties. The competitive conditions in the homebuilding industry can negatively affect our sales volumes, selling prices and incentive levels, reduce our profit margins, and cause the value of our inventory or other assets to be impaired. Competition can also affect our ability to acquire suitable land, raw materials and skilled labor at acceptable prices or terms, or cause delays in the construction of our homes. The competitors to our financial services businesses include other title companies and mortgage lenders, including national, regional and local mortgage banks and other financial institutions. Some of these competitors are subject to fewer governmental regulations and have greater access to capital than we do, and some of them may operate with different lending criteria than we do. These competitors may offer a broader or more attractive array of financing and other products and services to potential customers than we do. Our homebuilding and financial services businesses compete with other companies across all industries to attract and retain highly skilled and experienced employees, managers and executives. Competition for the services of these individuals increases as business conditions improve in the homebuilding and financial services industries and in the general economy. If we are unable to attract and retain key employees, managers or executives, our business could be adversely affected. Our business could be adversely affected by the loss of key personnel. We rely on our key personnel to effectively operate and manage our homebuilding and financial services businesses. Specifically, our success depends heavily on the performance of our homebuilding division and region presidents and their management teams, our financial services management team, our corporate office management teams and our executive officers. These key personnel have significant experience and skills in the homebuilding and financial services industries, as well as leadership and management abilities that are important to our success. We seek to retain our key personnel and to have succession plans in place to address the potential loss of key personnel. However, if our retention and succession planning efforts are unsuccessful or if we fail to attract suitable replacements, the loss of key personnel could adversely affect our business. We use information technology and other computer resources to carry out important operational and marketing activities and to maintain our business records. These information technology systems are dependent upon global communications providers, web browsers, third-party software and data storage providers and other aspects of the Internet infrastructure that have experienced security breaches, cyber-attacks, significant systems failures and service outages in the past. A material breach in the security of our information technology systems or other data security controls could include the theft or release of customer, employee or company data. A data security breach, a significant and extended disruption in the functioning of our information technology systems or a breach of any of our data security controls could disrupt our business operations, damage our reputation and cause us to lose customers, adversely impact our sales and revenue and require us to incur significant expense to address and remediate or otherwise resolve these kinds of issues. The release of confidential information as a result of a security breach could also lead to litigation or other proceedings against us by affected individuals or business partners, or by regulators, and the outcome of such proceedings, which could include penalties or fines, could have a significant negative impact on our business. We may also be required to incur significant costs to protect against damages caused by information technology failures or security breaches in the future. We routinely utilize information technology security experts to assist us in our evaluations of the effectiveness of the security of our information technology systems, and we regularly enhance our security measures to protect our systems and data. However, because the techniques used to obtain unauthorized access, disable or degrade systems change frequently and often are not recognized until launched against a target, we may be unable to anticipate these techniques or to implement adequate preventative measures. Consequently, we cannot provide assurances that a security breach, cyber-attack, data theft or other significant systems or security failures will not occur in the future, and such occurrences could have a material and adverse effect on our consolidated results of operations or financial position. In addition to our inventories of land, lots and homes, we own office buildings totaling approximately 1,000,000 square feet, and we lease approximately 529,000 square feet of office space under leases expiring through November 2023 . These properties are located in our various operating markets to house our homebuilding and financial services operating divisions and our regional and corporate offices. We own ranch land and improvements totaling approximately 93,600 acres which we use to conduct ranching and agricultural activities and to host company meetings and events. We are involved in lawsuits and other contingencies in the ordinary course of business. While the outcome of such contingencies cannot be predicted with certainty, we believe that the liabilities arising from these matters will not have a material adverse effect on our consolidated financial position, results of operations or cash flows. However, to the extent the liability arising from the ultimate resolution of any matter exceeds our estimates reflected in the recorded reserves relating to such matter, we could incur additional charges that could be significant. In May and July of 2014, we received Notices of Violation from the United States Environmental Protection Agency related to stormwater compliance at certain of our sites in the Southeast. This matter could potentially result in monetary sanctions to the Company; however, we do not believe it is reasonably possible that this matter would result in a loss that would have a material effect on our consolidated financial position, results of operations or cash flows. In fiscal 2013, our mortgage subsidiary was subpoenaed by the United States Department of Justice (DOJ) regarding the adequacy of certain underwriting and quality control processes related to Federal Housing Administration loans originated and sold in prior years. We have provided information related to these loans and our processes to the DOJ, and communications are ongoing. The DOJ has to date not asserted any formal claim amount, penalty or fine. information technology failures and data security breaches. We undertake no obligation to publicly update or revise any forward-looking statements, whether as a result of new information, future events or otherwise. However, any further disclosures made on related subjects in subsequent reports on Forms 10-K, 10-Q and 8-K should be consulted. Additional information about issues that could lead to material changes in performance and risk factors that have the potential to affect us is contained in Item 1A, “Risk Factors” under Part I of this annual report on Form 10-K.
General — A comprehensive enumeration of the significant accounting policies of D.R. Horton, Inc. and subsidiaries is presented in Note A to the accompanying financial statements as of September 30, 2017 and 2016 , and for the years ended September 30, 2017 , 2016 and 2015 . Each of our accounting policies has been chosen based upon current authoritative literature that collectively comprises U.S. Generally Accepted Accounting Principles (GAAP). In instances where alternative methods of accounting are permissible under GAAP, we have chosen the method that most appropriately reflects the nature of our business, the results of our operations and our financial condition, and have consistently applied those methods over each of the periods presented in the financial statements. The Audit Committee of our Board of Directors has reviewed and approved the accounting policies selected. Revenue Recognition — We generally recognize homebuilding revenue and related profit at the time of the closing of a sale, when title to and possession of the property are transferred to the buyer. In situations where the buyer’s financing is originated by DHI Mortgage, our 100% owned mortgage subsidiary, and the buyer has not made an adequate initial or continuing investment, the profit is deferred until the sale of the related mortgage loan to a third-party purchaser has been completed. Any profit on land sales is deferred until the full accrual method criteria are met. When appropriate, revenue and profit on long-term construction projects are recognized under the percentage-of-completion method. We include proceeds from home closings held for our benefit at title companies in homebuilding cash. When we execute sales contracts with our homebuyers, or when we require advance payment from homebuyers for custom changes, upgrades or options related to their homes, we record the cash deposits received as liabilities until the homes are closed or the contracts are cancelled. We either retain or refund to the homebuyer deposits on cancelled sales contracts, depending upon the applicable provisions of the contract or other circumstances. We recognize financial services revenues associated with our title operations as closing services are rendered and title insurance policies are issued, both of which generally occur simultaneously as each home is closed. We transfer substantially all underwriting risk associated with title insurance policies to third-party insurers. We typically elect the fair value option for our mortgage loan originations. Mortgage loans held for sale are initially recorded at fair value based on either sale commitments or current market quotes and are adjusted for subsequent changes in fair value until the loans are sold. Net origination costs and fees associated with mortgage loans are recognized at the time of origination. The expected net future cash flows related to the associated servicing of a loan are included in the measurement of all written loan commitments that are accounted for at fair value through earnings at the time of commitment. We generally sell the mortgages we originate and the related servicing rights to third-party purchasers within 30 days of origination. Interest income is earned from the date a mortgage loan is originated until the loan is sold. Some mortgage loans are sold with limited recourse provisions, which can result in repurchases of loans previously sold to investors or payments to reimburse investors for loan losses. Based on historical experience, discussions with our mortgage purchasers, analysis of the mortgages we originated and current housing and credit market conditions, we estimate and record a loss reserve for mortgage loans held in portfolio and mortgage loans held for sale, as well as known and projected mortgage loan repurchase requests. Inventories and Cost of Sales — Inventory includes the costs of direct land acquisition, land development and home construction, capitalized interest, real estate taxes and direct overhead costs incurred during development and home construction. Costs that we incur after development projects or homes are substantially complete, such as utilities, maintenance, and cleaning, are charged to SG&A expense as incurred. All indirect overhead costs, such as compensation of sales personnel, division and region management, and the costs of advertising and builder’s risk insurance are charged to SG&A expense as incurred. Land and development costs are typically allocated to individual residential lots on a pro-rata basis, and the costs of residential lots are transferred to construction in progress when home construction begins. Home construction costs are specifically identified and recorded to individual homes. Cost of sales for homes closed includes the specific construction costs of each home and all applicable land acquisition, land development and related costs (both incurred and estimated to be incurred) allocated to each residential lot based upon the total number of homes expected to be closed in each community. Any changes to the estimated total development costs subsequent to the initial home closings in a community are generally allocated on a pro-rata basis to the remaining homes in the community associated with the relevant development activity. When a home is closed, we generally have not paid all incurred costs necessary to complete the home. We record a liability and a charge to cost of sales for the amount estimated to ultimately be paid related to completed homes that have been closed. We compare our home construction budgets to actual recorded costs to determine the additional costs remaining to be paid on each closed home. We monitor the accrual by comparing actual costs incurred on closed homes in subsequent months to the amounts previously accrued. Although actual costs to be paid in the future on previously closed homes could differ from our current accruals, such differences have not been significant. performance of other communities in nearby locations. • local economic and demographic trends. For those assets deemed to be impaired, the impairment to be recognized is measured as the amount by which the carrying amount of the assets exceeds the fair value of the assets. Our determination of fair value is primarily based on discounting the estimated cash flows at a rate commensurate with the inherent risks associated with the assets and related estimated cash flow streams. When an impairment charge for a community is determined, the charge is then allocated to each lot in the community in the same manner as land and development costs are allocated to each lot. Impairment charges are also recorded on finished homes in substantially completed communities when events or circumstances indicate that the carrying values are greater than the fair values less estimated costs to sell these homes. For the inventory impairment analyses performed during fiscal 2017 , we assumed that for the majority of communities, sales prices in future periods will be equal to or lower than current sales order prices in each community, or in comparable communities, in order to generate an acceptable absorption rate. The remaining lives of the communities evaluated were estimated to be in a range from six months to two years , and we utilized a range of discount rates for communities from 12% to 18% . We rarely purchase land for resale. However, when we own land or communities under development that do not fit into our development and construction plans, and we determine that we will sell the asset, the project is accounted for as land held for sale if certain criteria are met. We record land held for sale at the lesser of its carrying value or fair value less estimated costs to sell. In performing the impairment evaluation for land held for sale, we consider several factors including, but not limited to, recent offers received to purchase the property, prices for land in recent comparable sales transactions and market analysis studies, which include the estimated price a willing buyer would pay for the land. If the estimated fair value less costs to sell an asset is less than the current carrying value, the asset is written down to its estimated fair value less costs to sell. The key assumptions relating to inventory valuations are impacted by local market and economic conditions, and are inherently uncertain. Although our quarterly assessments reflect management’s best estimates, due to uncertainties in the estimation process, actual results could differ from such estimates. Business Acquisitions — We account for acquisitions of businesses by allocating the purchase price of the business to the various assets acquired and liabilities assumed at their respective fair values. Any excess of the purchase price over the estimated fair values of the identifiable net assets acquired is recorded as goodwill. Significant judgment is often required in estimating the fair value of assets acquired, particularly intangible assets. These estimates and assumptions are based on historical experience, information obtained from the management of the acquired companies and our estimates of significant assumptions that a market participant would use when determining fair value. While we believe the estimates and assumptions are reasonable, they are inherently uncertain. Unanticipated market or macroeconomic events and circumstances may occur, which could affect the accuracy or validity of the estimates and assumptions. Goodwill — We record goodwill associated with our acquisitions of businesses when the purchase price of the business exceeds the fair value of the net tangible and identifiable intangible assets acquired. We evaluate our goodwill balances for potential impairment on at least an annual basis by comparing the carrying value of each of our operating segments with goodwill to their estimated fair values. The estimated fair value is determined by discounting the future cash flows of the operating segment to their present value. If the carrying value of the operating segment exceeds its fair value, we determine if an impairment exists based on the implied fair value of the operating segment’s goodwill. As a result of the goodwill evaluation performed in fiscal 2017 , no impairment charges were recorded. As a result of the goodwill evaluation performed in fiscal 2016 , an impairment charge of $7.2 million was recorded to write off the remaining goodwill associated with the Huntsville operating segment in the Southeast reporting region. This operating segment experienced lower levels of profitability than anticipated primarily due to difficult market conditions. Our total goodwill balance was $80.0 million at both September 30, 2017 and 2016 . Warranty Claims — We typically provide our homebuyers with a ten-year limited warranty for major defects in structural elements such as framing components and foundation systems, a two-year limited warranty on major mechanical systems and a one-year limited warranty on other construction components. Since we subcontract our construction work to subcontractors who typically provide us with an indemnity and a certificate of insurance prior to receiving payments for their work, claims relating to workmanship and materials are generally the primary responsibility of the subcontractors. Warranty liabilities have been established by charging cost of sales for each home delivered. The amounts charged are based on management’s estimate of expected warranty-related costs under all unexpired warranty obligation periods. Our warranty liability is based upon historical warranty cost experience in each market in which we operate, and is adjusted to reflect qualitative risks associated with the types of homes we build and the geographic areas in which we build them. Actual future warranty costs could differ from our currently estimated amounts. A 10% change in the historical warranty rates used to estimate our warranty accrual would not result in a material change in our accrual. Legal Claims and Insurance — We are named as a defendant in various claims, complaints and other legal actions in the ordinary course of business. At any point in time, we are managing several hundred individual claims related to construction defect matters, personal injury claims, employment matters, land development issues, contract disputes and other matters. We have established reserves for these contingencies based on the estimated costs of pending claims and the estimated costs of anticipated future claims related to previously closed homes. Approximately 98% and 95% of these reserves related to construction defect matters at September 30, 2017 and 2016 , respectively. Our reserves for construction defect claims include the estimated costs of both known claims and anticipated future claims. At both September 30, 2017 and 2016 , we had reserves for approximately 140 pending construction defect claims, and no individual existing claim was material to our financial statements. During fiscal 2017 , we established reserves for approximately 75 new construction defect claims and resolved 75 construction defect claims for a total cost of $52.6 million . We have closed a significant number of homes during recent years, and we may be subject to future construction defect claims on these homes. Although regulations vary from state to state, construction defect issues can generally be reported for up to ten years after the home has closed in many states in which we operate. Historical data and trends regarding the frequency of claims incurred and the costs to resolve claims relative to the types of products and markets where we operate are used to estimate the construction defect liabilities for both existing and anticipated future claims. These estimates are subject to ongoing revision as the circumstances of individual pending claims and historical data and trends change. Adjustments to estimated reserves are recorded in the accounting period in which the change in estimate occurs. Historical trends in construction defect claims have been inconsistent, and we believe they may continue to fluctuate. Housing market conditions have been volatile across most of our markets over the past ten years, and we believe such conditions can affect the frequency and cost of construction defect claims. We closed a significant number of homes over the past ten years. If the ultimate resolution of construction defect claims resulting from our home closings in prior years varies from current expectations, it could significantly change our estimates regarding the frequency and timing of claims incurred and the costs to resolve existing and anticipated future claims, which would impact the construction defect reserves in the future. If the frequency of claims incurred or costs of existing and future legal claims significantly exceed our current estimates, they will have a significant negative impact on our future earnings and liquidity. We estimate and record receivables under the applicable insurance policies related to our estimated contingencies for known claims and anticipated future construction defect claims on previously closed homes and other legal claims and lawsuits incurred in the ordinary course of business when recovery is probable. Additionally, we may have the ability to recover a portion of our losses from our subcontractors and their insurance carriers when we have been named as an additional insured on their insurance policies. The estimation of losses related to these reserves and the related estimates of recoveries from insurance policies are subject to a high degree of variability due to uncertainties such as trends in construction defect claims relative to our markets and the types of products built, claim frequency, claim settlement costs and patterns, insurance industry practices and legal interpretations, among others. Due to the high degree of judgment required in establishing reserves for these contingencies, actual future costs and recoveries from insurance could differ significantly from current estimated amounts. A 10% increase in the claim frequency and the average cost per claim used to estimate the reserves would result in an increase of approximately $71.4 million in our reserves and a $36.1 million increase in our receivable, resulting in additional expense of $35.3 million . A 10% decrease in the claim frequency and the average cost per claim would result in a decrease of approximately $63.9 million in our reserves and a $28.6 million decrease in our receivable, resulting in a reduction in expense of $35.3 million . Income Taxes — We calculate our income tax expense (benefit) using the asset and liability method, under which deferred tax assets and liabilities are recognized based on the future tax consequences attributable to temporary differences between the financial statement amounts of assets and liabilities and their respective tax bases and attributable to net operating losses and tax credit carryforwards. When assessing the realizability of deferred tax assets, we consider whether it is more likely than not that some portion or all of the deferred tax assets will not be realized. The realization of deferred tax assets is dependent upon the generation of sufficient taxable income in future periods and in the jurisdictions in which those temporary differences become deductible. We record a valuation allowance when we determine it is more likely than not that a portion of our deferred tax assets will not be realized. The accounting for deferred taxes is based upon estimates of future results. Differences between the anticipated and actual outcomes of these future results could have a material impact on our consolidated results of operations or financial position. Also, changes in existing federal and state tax laws and tax rates could affect future tax results and the valuation of our deferred tax assets. Interest and penalties related to unrecognized tax benefits are recognized in the financial statements as a component of income tax expense. Significant judgment is required to evaluate uncertain tax positions. We evaluate our uncertain tax positions on a quarterly basis. Our evaluations are based upon a number of factors, including changes in facts or circumstances, changes in tax law, correspondence with tax authorities during the course of audits and effective settlement of audit issues. Changes in the recognition or measurement of uncertain tax positions could result in increases or decreases in our income tax expense in the period in which we make the change. 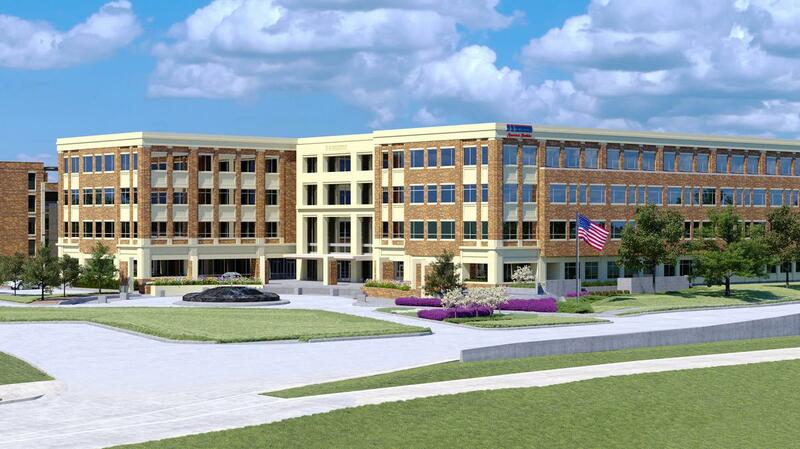 CH Investments of Texas, Inc. CHI Construction Company CHM Partners, L.P. The Club at Cobblestone, LLC The Club at Hidden River, LLC Continental Homes, Inc.
Continental Homes of Texas, L.P.
DHI Communities Construction of Florida, LLC DHI Communities Construction of Texas, LLC DHI Insurance, Inc.
DHI Mortgage Company GP, Inc. DHI Mortgage Company LP, Inc. DHI Mortgage Company, Ltd.
DHI Title of Alabama, Inc.
DHI Title of Arizona, Inc.
DHI Title of Texas, Ltd.
D.R. Horton - Crown, LLC D.R. Horton - Emerald, Ltd.
D.R. Horton - Texas, Ltd.
D.R. Horton, Inc. - Torrey D.R. Horton, Inc. Foundation D.R. Horton BAY, Inc.
D.R. Horton Cruces Construction, Inc. D.R. Horton Insurance Agency, Inc. D.R. Horton LA North, Inc.
D.R. Horton Life Insurance Agency, Inc.
D.R. Horton Los Angeles Holding Company, Inc.
D.R. Horton Management Company, Ltd. D.R. Horton Materials, Inc.
D.R. Horton Realty of Central Florida, LLC D.R. Horton Realty of Georgia, Inc.
D.R. Horton Seabridge Marina, Inc.
DRH Oil & Gas, Inc. DRH Properties, Inc.
DRH Regrem XVII, Inc. DRH Regrem XVIII, Inc. DRH Regrem XIX, Inc.
Emerald Creek No. 4, L.P. Founders Oil & Gas Operating, LLC Freedom Realty of Tampa, LLC Georgetown Data, Inc.
Haskell Canyon Partners II, L.P.
Martin Road Lake Forest, LLC McQueen & Willis, LLC Meadows I, Ltd.
Meadows VIII, Ltd. Meadows IX, Inc. Meadows X, Inc. Melody Homes, Inc.
Schuler Homes of California, Inc. Schuler Homes of Oregon, Inc.
Western Pacific Brea Development, LLC Western Pacific Housing, Inc.
Western Pacific Housing-Lomas Verdes, LLC Western Pacific Housing-Lyons Canyon Partners, LLC Western Pacific Housing Management, Inc.
Western Pacific Housing-Terra Bay Duets, LLC Western Pacific Housing-Torrey Meadows, LLC Western Pacific Housing-Torrey Village Center, LLC Western Pacific Housing - Westlake II, L.P.
91 st Avenue & Happy Valley, L.L.C. We hereby consent to the incorporation by reference in the Registration Statement on Form S-3 (No. 333-206226), Registration Statement on Form S-4 (No. 333- 89344) and the Registration Statements on Form S-8 (Nos. 33-48874, 33-83162, 333-72423, 333-69694, 333-90988, 333-89346, 333-133948, 333-208116) of D.R. Horton, Inc. of our report dated November 15, 2017 relating to the financial statements and the effectiveness of internal control over financial reporting, which appears in this Form 10-K.